The retired railroad watch inspector (Ray Ashcraft) who taught me so much about the restoration of pocket watches once told me that the most important tool in a shop was the lathe. As time has gone by I have realized just how true that bit of wisdom really is. A lathe gives us the capability to make many of the other tools we need. I have also come to realize that a lathe is simply a platform on which one can mount a number of attachments. This Technical Tid-Bit focuses on using one such attachment - a three-jaw face plate - for drilling holes in small work-pieces. I can vaguely remember the first time I tried to drill a very small hole in a very small piece of metal. Back then I had a small drill press, one that could hold very fine drills, and I had several machinists’ clamps. In theory, it was possible for me to gently punch a dimple in the piece of metal and then position it just right on the drill press platform so I could drill a hole. Being a very small hole, and since the piece of metal was hardened, I was using a carbide drill bit. Despite my best efforts, the dimple was not exactly lined up with the tip of the drill bit, and one thing that carbide will not abide is flex. So, scrap one drill bit. I did finally get the hole drilled, but I will admit I was just a bit frustrated - trying to hold a very small piece of metal so I could drill an even smaller hole. 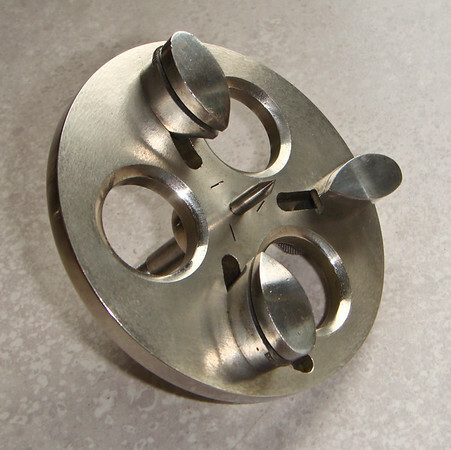 My mentor, Ray Ashcraft, had told me about three-jaw face plates, explaining that they had a pointy plunger - called a pump center - that allowed one to align a hole such that it was exactly centered in the face plate. See Figures 1, 2, 3 and 4 for an overview of a watchmakers face plate.